And if Roy had a wallet with all his girlfriends pictures in it I'm sure it was confiscated and is in the possession of the Milliary tribunal as evidence. But I'm sure it would have rivaled Hughes display. seeing as how i cosplay Hughes and Roy, it obvious I would win. OK, Sybil. We'll see what you come up with in '09. Don't encourage them?? We need more Hugheses. My two favorites are retiring. I'm in the process of training a friend of mine to be Hughes, but it looks like I'm going to be in charge of photos... Raver, I could use your help. i think she meant dont encourage them making pictures and showing them off, buuuuttttt its to late i have to re-do my picture thread again one of the pictures is a close up of Elysia holding Hughes's finger, but everyone takes it as something inapropriate and with his neck to, it just is all grrr. i also dont like the style it was done in to much in anyway, so its gonna be difficult getting it out and then finding a new one to put in. what do you need help with exactly? cuz im sure i can help or re-direct you to someone who could if i am incapable. i missed the invasion of the HS panel because i was doing the MSA panel i wanted to do the invasion, but i had my obligations. if something like that is done next year, lets try to make sure it doesnt conflict with anything else FMA. 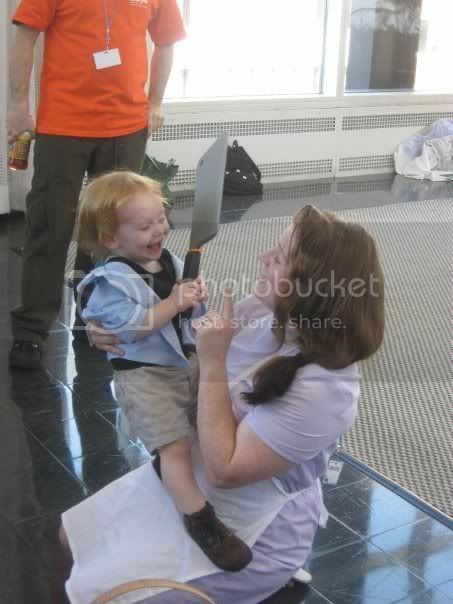 I think my favorite moment at the photo shoot, and possibly the whole con, was when my Little Ed got hold of one of Izumi Sensei's knives and started beating me with it. lol He had this almost maniacal grin on his face, too! Oh, but then there was also when Ed dropped his apple and Hughes rushed over and gave it back to him! So KAWAII!! Oh, oh and then there was when Hughes was taking pictures with 2 cameras at once! That was awesome! LOL I have a photo of that somewhere on my work computer. I'll have to send it to you. You do?! Wait.... which one? I don't remember who sent it to me. He's such an adorable lil Munchkin. He had an absolute BALL at the con! I can't wait to take him to CTcon in a few weeks. ^_^ Hopefully, we'll have him in the right sandals by then. If not, we'll just use his other sandals. At least at CTcon I won't be lugging coats around the entire con. It's going to be awesome! Thank you so much! ^_^ He is my pride and joy. I loved how you came out while we were all waiting in line to entertain us it was so much fun! Speaking of FMA, we had an Ed cameo in our first HD film shoot HUA!